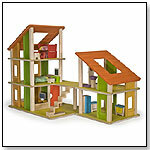 This dollhouse features two units which can be arranged in various ways. Also includes a huge skylight and one movable staircase. Five rooms of furniture are included. Made of eco-friendly PlanWood and solid rubber wood.